They are organised into several main themes, below. Summaries and the main documents are available. We welcome your feedback and comments on the issues raised, or on other ongoing issues of interest to health journalists and journalists coming to health reporting for the first time. Please Register - free of charge - to access our interactive blog and other resources on this website. Health Journalism - Why Does it Matter? 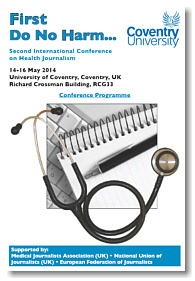 Panel discussion - why does health journalism matter?